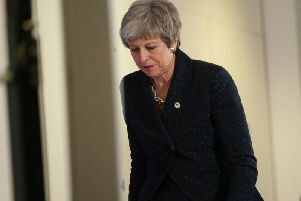 Hartlepool MP Mike Hill has signed a motion of no confidence in the Prime Minister over her Brexit deal. Mr Hill backed the motion proposed in Parliament by Labour leader Jeremy Corbyn demanding Theresa May hold a meaningful vote on the Withdrawal Agreement before Christmas. Prime Minister Theresa May in the House of Commons. Picture: UK Parliament/Jessica Taylor/PA Wire. Mr Hill said on his Facebook page: “She also is wanting to kick the meaningful vote can further down the road; because she will lose it. “While I’ve been on the Fisheries Bill dealing with the business end of one of the loudest Brexit topics – breaking away from the common fisheries agreement – the rigmarole on the green benches has been unimaginable. “May is truly the captain of a rudderless and sinking ship. Happy to sign the motion of no confidence in her. Downing Street accused Mr Corbyn of a political “stunt” in tabling the no confidence motion which is non-binding. The wording of the motion, targeted at Mrs May rather than the Government as a whole, would not trigger the process set out under the Fixed-Term Parliaments Act which could eventually lead to a General Election. The Prime Minister had said the Commons would have the chance to debate her Withdrawal Agreement in the week MPs return to Westminster after Christmas on January 7. The crucial vote, which was postponed earlier this month to avoid a heavy defeat, will take place in the week beginning January 14. It is up to the Government to decide whether to schedule time for a debate on the confidence motion. A Downing Street source said on Monday night: “We won’t allow time for what is a stunt. Last week, Mr Hill told the Mail he would vote against Theresa May’s Brexit deal after receiving a ‘clear mandate’ from both Hartlepool remainers and leavers that it is a bad deal. He said: “I have received hundreds upon hundreds of emails both of remainers and leavers asking me to vote the deal down, it’s not a good deal for either of them.